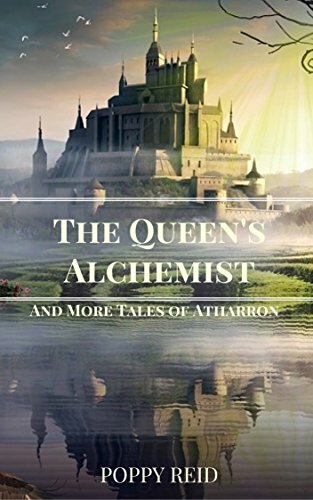 The Queen’s Alchemist and More Tales of Atharron is a collection of Flash Stories that intertwine to tell the narrative of the Kingdom of Atharron embroiled at war with the giants to the north while a neighboring kingdom schemes and plot because of the bad blood of the two queens. Queen Cassandra struggles to preserve her nation from the giants while her own alchemist plots against her. The short vignettes all interweave around each other, each one painting hints at the story going on, touching here and there, sometimes in the court of Queen Cassandra, sometimes on the front line with the giants while in the background, the mages plot and scheme with their own idea of where to take Atharron and achieve their goals. The Queen’s Alchemist stands to hint at the back story of Reid’s Blood Scroll Trilogy, teasing us with the back story of the Mages who have so shaped the events of Theldinya. It takes us back to their roots, before their mad ambition unleashed the events of the Blood Scroll Trilogy centuries later. Each vignette introduces its lead character, giving just a taste of their life, telling an eyeblink of their life. They are well written, each flowing to the next, forming an entire short story from the disparate parts. If you want to get a taste of Reid’s writing style or if you are a fan of the Blood Scroll Trilogy (and if you’re not, why haven’t you read them?) then you will want to read these flash stories. A perfect read for a cold, rainy, winter afternoon! You can by The Queen’s Alchemist: And More Tales of Atharron from Amazon! Sounds really cool. I’ll have to check it out.